Arthur Murray dance studio Instructor Julio Cesar Sirianni, left, works with Deb Hendrickson, of Fairfield, in the Danbury studio. Arthur Murray offered discounted dance lessons to benefit Housatonic Habitat for Humanity on Friday, January 11, 2019, in Danbury, Conn.
Aleksandar Vukosavljevic and his dance partner, Nevena, the fourth-ranked American-style ballroom team in the world, will get the Premier Ballroom Dance Company’s 2019 year of events underway at the Holy Trinity Greek Church Community Center in Bridgeport on Jan. 26. with an elegant show. 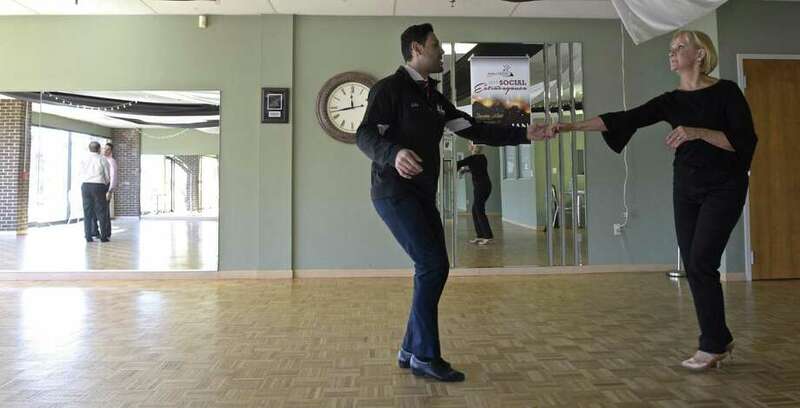 Nevena, only is recognized by her first name, is owner with her husband Marko, of the Fred Astaire dance studio in Trumbull. Dance partnering with Vukosavljevic for less than a year, the dancers were grand finalists for the world title held in Blackpool, England, and silver medalists at the coveted Killick Royale Classic in London. On Dec. 1, they took third place in Russia in the prestigious Moscow Ball. Showtime for the Bridgeport show is 9:30 p.m. with general dancing from 7 p.m. to 11:30 p.m. to deejay MB Music. Singles and couples are welcome. Cost is $20. Call 203-374-7308 for reservations and further information. The Kennedy Center received a $20,000 gift right before the holidays, thanks to the Tony Dovolani Golf for Special Needs Children not-for-profit. Stratford resident George Perham, who organizes the golf event, stopped by The Kennedy Center’s Project Ability to hand-deliver a check for $20,000, raised through the annual golf tournament. Dovolani, long-time Connecticut resident and a Dancing with the Stars Mirror Ball Champion, has donated proceeds from the invitational to The Kennedy Center’s Autism Project since 2017. The tournament started three years ago at Mill River Country Club in Stratford and because of its popularity, Tony added an additional tournament this year at The Patterson Club in Fairfield. A&S Italian Fine Foods is set to celebrate its 25th anniversary serving Fairfield with a Customer Appreciation Day on Jan. 19 beginning at noon at 2079 Black Rock Turnpike. Sen. Tony Hwang will be on hand to present A&S owners, Carmine and Doreen Battimelli, with a business recognition award for their 25 years serving Fairfield and being an important part of the local community. Throughout the afternoon, A&S customers will enjoy tasting a variety of A&S specialty sausages made by hand from a family recipe, antipasto, other hors d’oeuvres and specialty grocery products only found at A&S, plus Italian refreshments of illy espresso and S. Pellegrino water. There will also be food-based contests and Italian specialty item giveaways for customers. To celebrate its 25th anniversary, A&S Italian Fine Foods will continue to host special customer appreciation events, including food tastings, cooking demonstrations, and giveaways throughout the new year. For more information, visit the store at 2079 Black Rock Turnpike or call 203-576-1600. The Fairfield Shopping Center, anchored by Bob’s Stores, has two new tenants, Angel Commercial LLC president Jon Angel said in a news release. The two new tenants are the Post Road Dry Cleaners and AR Workshop. The Post Road Dry Cleaners signed a long-term lease for 2,393 square feet at 909 Post Road next to Jenny Craig and relocated their store from the Rings End Plaza. AR Workshop signed a lease for 2,000-square-feet of space at 869 Post Road next to the UPS Store and Coco Day Spa & Nails. AR Workshop is a boutique DIY studio that offers hands-on classes for creating custom, charming home decor from raw materials. A Behavioral Health Legislative Forum will be held on Jan. 23 at 7 p.m. at First Church Congregational in Fairfield. The event, hosted by local community organizations that provide support and education for people affected by mental illness, are presenting an evening with local state representatives and senators to discuss mental health issues. The focus will be on mental health parity, peer support services, and community support services. The event is free and open to the public. Light refreshments will be served. RSVP or for more information visit: www.namifairfield.org.